This very popular classic portrayal of the famous Wedge-Tailed Eagle is an Australian icon. Pre-shaded on brilliant black velveteen. Measuring 50 x 76cm. Requires colours: 1, 3, 12, 14, 66. Comes complete with instructions. Try using Jumbo Tips on velvet as the larger tips allow more paint to flow freely on the raised fabric. 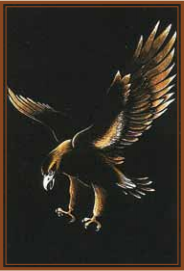 Hi I was wondering whether the Wedge tail eagle needs standard paint tubes or if we could make do with half size ones. Would the tips fit the half size tubes?